Elegant, soulful original modern jazz with a unique jazz piano trio sound. Since moving to the Bay Area from Los Angeles to attend UC Berkeley in 1994, Ben has become one of the most in demand jazz pianists in the area both as a leader and sideman. He has performed at Yoshi’s and the Kuumbwa Jazz Center, at the Healdsburg and SF Jazz Festivals, at Oakland’s Art and Soul Festival, and has also toured and performed throughout Japan. He has performed with many great musicians including Craig Handy, Akira Tana, Lorca Hart, Andrew Speight, Vince Lateano, Michael O’neill, and vocalist Kenny Washington. He also collaborates with his sister Stephanie who is a vocalist and songwriter living in San Francisco, and performs with her under the band name, “Stoli Rose.” Ben is also a faculty member of the Jazzschool in Berkeley, CA. This album puts me in a good mood and sets me at ease. I really enjoy putting it on replay and listening. Heard Ben and company on my local jazz station. Had to get the CD. On repeated (often!) listenings, I keep finding new directions and chromatics. Deceptively simple arrangements and masterful playing by all really make this a top-notch effort. Super work. This is an album beautifully and tastefully done. 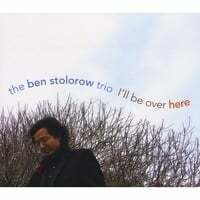 Stolorow's original compositions are great songs and I appreciate his adherence to "Less is More" as it applies to jazz music. Great production, lean playing...I hear every note. Nice job!